Communities in tropical regions along the Andean Cordillera in South America face an uncertain future, as mountain lakes and snow peaks exhibit receding trends and strong fluctuations associated with climatic drivers (i.e., climate change and El Niño) and local human activities. Such fluctuations are apparent in Colombia, where these changes will have direct impact on strategic ecosystems such as the Orinoco and Amazon basins and the highly populated Cauca and Magdalena River basins. Therefore, understanding how these water systems evolve in the near future is of critical importance for the communities that depend on them for their survival. 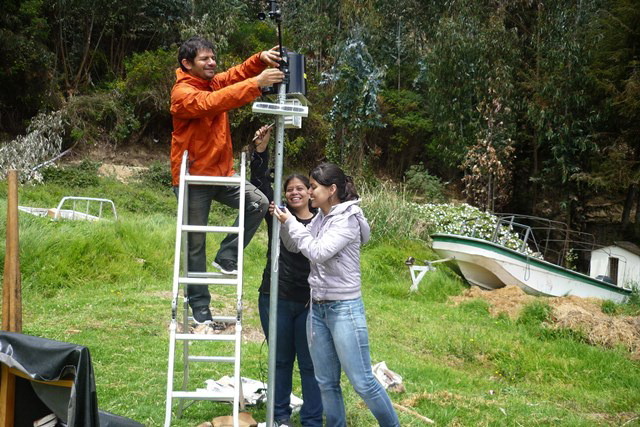 This project aims to develop long-term monitoring of the evolution of three natural water bodies: Colombia´s two main Andean lakes (Tota and Cocha) and the floodplain wetland of Ayapel. These natural reservoirs not only represent the accumulated effect of hydrological processes in their respective basins but also serve as examples of highly intervened environments from which several rural and urban communities derive their water resources and develop their economic activities. This project will gather data about the areas of interest by contacting local, national, and international agencies for technical reports, census information, hydrologic databases, and remote sensing imagery. The information gathered, as well as gauges installed at the lakes and visits to record geographical, geophysical, and socio-economic data, will be used to build models that describe the evolution of these bodies of water. The results of these studies will be available through technical and scientific papers as well as a website to be designed to offer easy access to geographically integrated and updated information useful for all interested parties locally and worldwide. The project should facilitate the development of improved models to determine the lake stage as a function of climate drivers and human uses to serve as a basis for future decision support for the communities involved. During the first quarter of 2015, US partner Dr. Francina Dominguez visited Dr. Cañón at the Universidad de Antioquia from the February 17 - 19. During the visit, Dr. Dominguez met with the team as well as students to discuss and advanced aspects of their research and offered to host a conference at the Universidad de Antioquia. Also during February, the project team conducted a workshop titled “Día de los Humedales-Universidad de Antioquia 2015 (Medellín, Antioquia)” in which the project team presented their research results to an audience of 32 stakeholders and students. In April, Dr. Cañón visited Dr. Dominguez in Tucson, Arizona to follow up on key project research outcomes. In March, Dr. Cañón participated in the Forum organized by USAID in Lima, Peru. The PI’s participation was very fruitful in establishing contacts with other PEER grant recipients in Colombia and the region and, as a result of these contacts, the PI will host Bradley Goodrich of the Office of Naval Research for a visit to the Universidad de Antioquia at the end of April. Dr. Cañón also established communication with the USAID mission in Colombia during the forum and will work closely with the mission to explore future projects and collaborative efforts. In the next quarter, doctoral student Isabel Hoyos will participate in a two-month research internship at EPhysLab, Environmental Physics Laboratory of the Faculty of Sciences of the Universidad de Vigo, Spain (May-June) and master’s students will submit their theses for evaluation at the Universidad de Antioquia. The PI and students will hold community workshops in each of the three project sites in the months of May and June. The workshops will include high school students, university students, local stakeholders, and decision makers and include opportunities for stakeholders to interact and discuss project results. The aim of the workshops is that local stakeholders and community members understand the resources resulting from the project and identify ways to use the data going forward. The project website will continue to be updated with new multimedia aids and materials as the project closeout approaches. The Environmental Engineering undergraduate team members will be working to incorporate an interactive game to simulate water balances in a lake in the website. The team also plans to release a video and book online. The footage for the documentary will be shot in May and June at all three projects sites during the community workshops. During July and early August, the PI will work with the master’s students and university staff in the preparation and printing of the book and in the production of the documentary.